The teenage years can be confusing and bewildering, especially when it comes to first love—I know mine were. Thankfully, JonArno Lawson has written a collection of simple but thought-provoking poems that highlights the quandary of teenage relationships. His words are encouraging, realistic, and quite blithe. 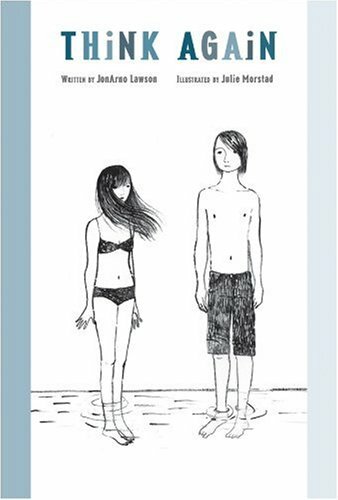 Julie Morstad’s provocative line art strengthens the story and adds a visually stimulating depth with her depiction of a girl and boy who are obviously dealing with the uncertainties of a new relationship and the self-discovery that comes with the territory. Think Again is a valuable choice for opening up discussions between peers, a parent and a teen, or an introspective soul-search. It’s a fast read that’s light and deep all at the same time.